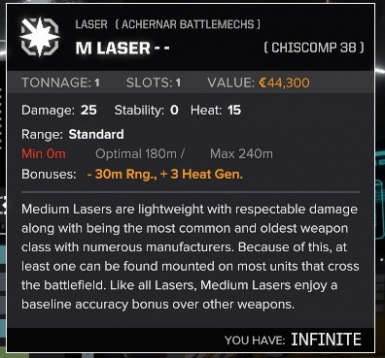 This mod adds a large number of canon weapon variants to the game, corrects incomplete or erroneous weapon model names from the base game, and applies these weapons to all existing 'Mech variants in the game as per their proper canon-specified models/manufacturers. Supports other 'Mech-adding mods, such as JK_Variants, and those found in the CAB. Based on feedback and testing, re-balanced flamers. In keeping with lore, reduced heat-vent to -1. Reduced stock flamer damage to 8 and heat damage to 9, adjusting all +/- variants in accordance. Increased compatibility with other mods by incorporating the use of Text Appending for the itemCollection CSVs (applies to shop compatibility). Added 13 additional canon weapon systems, bringing the total added by the mod to 286. Added support for the Stinger and Wasp, now that they have been released as part of the CAB. Added a missing heatsink to the VT-BL's left torso. Added two alternative manufacturer variants: Independence Weaponry-produced ASD-7, and Lycomb Davion IntroTech-produced AWS-8T. Added canon weapon coverage for the COM-2D-BI and COM-J from JK Variants. Other minor typo, lore consistency, and balance adjustments. Added an additional 65 canon weapons, bringing the total added by the mod to 273. Fixed several JSON typos that prevented some weapons from being properly added to the database. Fixed a number of mismatching +/- attributes and notes. Created new itemCollections for out-of-production models, adding them to the rare shop spawn tables based on factory locations (faction specific). Balance: decreased machine gun damage to a standard of 20. Balance: decreased flamer damage to a standard of 9, implemented variable damage of (3) for all flamers. Fixed several weapon JSONs which prevented them from loading or spawning in shops. Fixed a number of typos and mismatched + / - properties. Added an additional 22 canon weapons, bringing the total added by the mod up to 208. After thorough testing and feedback, boosted all AC jamming probabilities. Previous values effectively rendered reliable weapons virtually un-jammable. 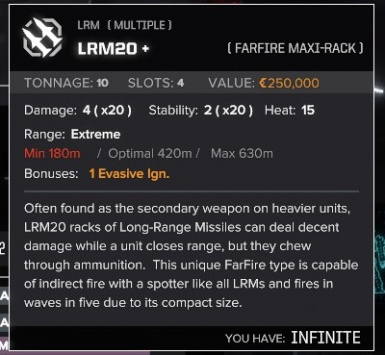 Made a number of adjustments to illogical new weapon pricing based on rarity/quality. Added support for a number of new variants defined in the JK Variants mod, bringing coverage as of JK Variants 1.4.0.4. Added three new alternative canon manufacturer 'variants', one each for the Grasshopper, BattleMaster, and Rifleman. Added optional Rarity tags as a separate, complimenting mod. If you wish to limit the appearance of the alternative variants to faction/time period appropriateness then please place the WepDiv3025 Rarity Tags folder in your /Mods folder. Fixed a typo in the Longbow loadouts that prevented them from being loaded or spawned. Fixed a legacy compatibility issue from GT Weapon Diversity wherein there were 11 crits demanded in the Highlander 733P's left torso, preventing it from loading or spawning. Fixed typos in a few weapons that prevented them from being added to the game database. Added an alternative version of the Highlander 733P produced on Fletcher, carrying Caletra-produced MedLas. Corrected several cosmetic typos or fluff errors. Fixed compatibility issues with the CustomAmmoCategories mod which would cause a large number of the added weapons to fail to be added to the game database caused by non-uniform capitalization of certain JSON properties. Fixed an issue which prevented several itemCollections References from being honored by the game engine, sometimes resulting in empty or nearly empty shops at some star systems. Added support for the Flashpoint DLC 'Mechs (Crab, Cyclops, Hatchetman). Added one weapon (Brigadier Corp. produced PPC), bringing the total new models weapons to 186. Several minor typo and attribute fixes, some price, rarity, and balance adjustments to existing weapons. Optimized installation procedure and stability by using the Adv Merger function of ModTek. Added support for BD's Longbow. Added several new canon weapons, bringing the total additional weapon models to 185. Adjusted several shop spawn rates and prices for better balancing. Added three additional canon alternative variants (different factory): BNC-3S, COM-2D, WHM-6R. Altered the ammunition behavior of Flamers to fix an issue that would cause MechLab to infinitely load if the 'Mech selected was equipped with certain flamers. Adds a vast array of canon weapon models (286) to the game for the 3025 era, and updates all 'Mech existing variants in the base game to carry the appropriate models, plus those added by other mods. Also adds all new weapon variants to shops, weighted appropriately as to their lore-defined rarity. View the README text at bottom for installation instructions. Please note that only a VANILLA 'MECHBAY version of this mod currently exists. A MechEngineer version may be created when resources permit. Now includes an optional Rarity tags as a separate, complimenting mod. If you wish to limit the appearance of the alternative variants to faction/time period appropriateness then please place the WepDiv3025 Rarity Tags folder in your /Mods folder. Credit to Justin Kase and other authors for the infrastructure for this function. Using the functionality enabled by WeaponRealizer, appends the possibility of jamming to all Autocannons in the game. Healthy/reliable autocannons have a very low chance to jam. This has been tested in gameplay, and any weapons not known for jamming seldom do so. However, some models in lore are known for jamming or ammunition-feed issues, and so their chance to jam has been made higher than that of other Autocannons. Jamming probability is reduced by the gunnery skill of the present MechWarrior, so train up that gunnery! Sorts the new weapon models, allowing them to spawn in shops randomly with frequency depending on their rarity/quality. Prices have also been scaled based on quality/rarity for new weapons. Items will be in the uncommon/rare weapon pool for salvage spawn. You will also see a lot more - / + weapons, or unmarked weapons with different manufacturers, due to the fact that opposition units will be carrying their appropriate models instead of mostly STOCK weapons. 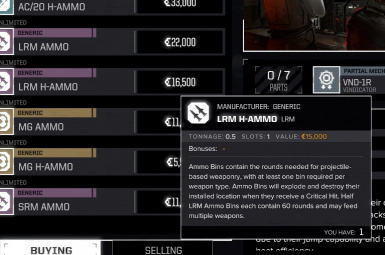 Half-Ton Ammunition boxes have been added to shops for all weapon types. For times when a full ton just isn't necessary. Medical teams have also indicated that downloading and installing this mod reinforces your sense of manliness and self-worth. Download and install it, now. - Will create an alternative version of the mod which restores TableTop range penalties (short/medium/long/extreme), and other ToHit penalties according to TableTop rules to the game when used. - Will add VehicleImprovementMod support. 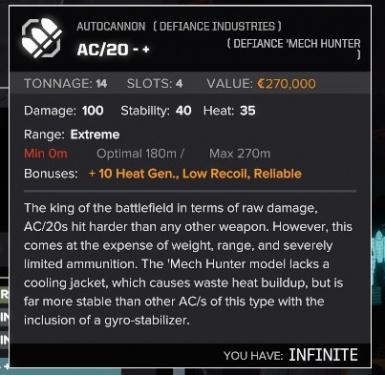 - Will increase the variety of 'Mech and 'Mech parts available for purchase randomly in shops, based on lore rarity and region availability. - Additional faction/manufacturer shop rate differentiation to be implemented. Note that this mod currently supports the VANILLA 'MechBay only. A MechEngineer version may be developed at some point. Before enabling this mod, ensure that you have the latest version of the WeaponRealizer mod installed and functional. 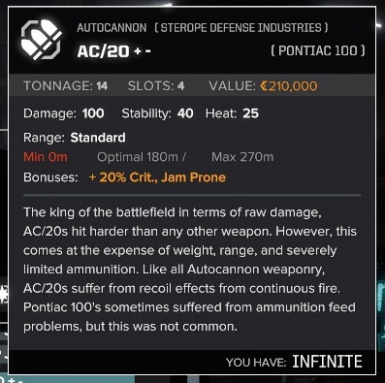 Autocannon jamming functionality depends on that mod. 1) After installing WeaponRealizer, copy the WeaponDiversity3025 folder into your Battletech/mods directory. 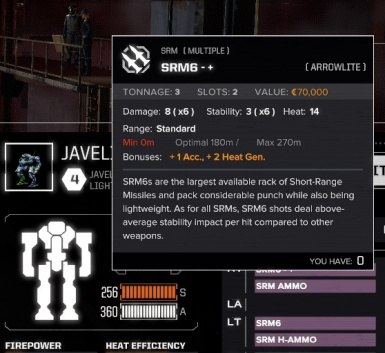 2) Optionally, download and copy the WedDiv3025 Rarity Tags folder to your Battletech/mods, if you wish to use the LanceDefs for the alternative manufacturer variants to limit their appearance. This is not necessary if you are using the latest version of JK Rarity Tags. Deleting the ".modTek" folder in your /Mods directory is recommended before initial usage, and during troubleshooting. 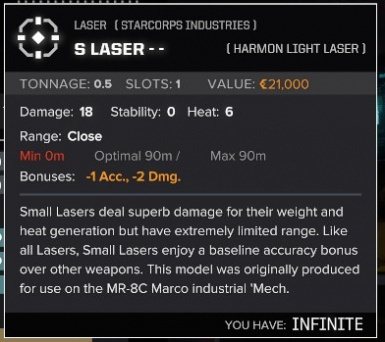 If you encounter any issues with 'Mech loadouts or weapons properties/flavor text then please ensure no mods that affect weapon or 'Mech files in whole are loading after this mod. You can check this in your .modTek folder within the /mods directory. There is a file there named "load_order", and you can use it to change the order in which ModTek loads your active mods.